Guns don’t kill people, but we can do better. Earlier today, someone I know posted this image on Facebook. As a rational person who values evidence and critical thinking, this photo misses the point by grossly oversimplifying a very complex issue. And while it maybe be technically true, that’s only in the most ideal sociological conditions. The real world is far more complex. It’s not about the gun, per sé, but it is definitely about the ability to commit mass-murder with a gun. 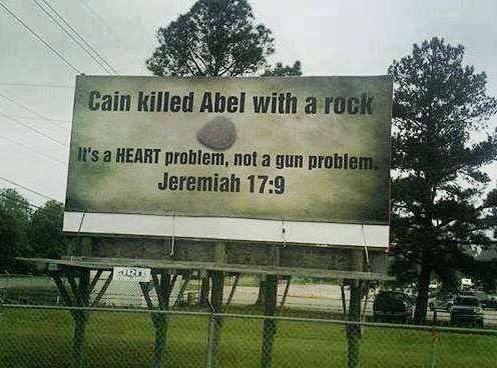 I’ve never seen or heard of anybody committing mass-murder with a rock. We have invented procedures and invested in research and development to make cars safer, airplanes safer, construction equipment safer, kitchen appliances safer, etc. Why isn’t the weapons industry investing into better procedures and security for weapons? Neither a “heart” nor a rock are able to kill 50 people in a nightclub within minutes. A rock could be used to kill a 22 year old singer who is signing autographs after a concert. However, if by investing more effort into background checks and psychological evaluations, or by inventing biometrics safety techniques or other methods which prevent accidental gun deaths, how many lives could be saved? I strongly support responsible gun ownership AND strong gun control laws. Those are not opposing ideas, but rather complementary ones. I personally believe there is value in more people being armed — primarily people performing security roles at schools, malls and airports. Looking at someone and expecting that they are packing heat will keep your actions in check. But I also believe that asking people to undergo a psychological evaluation is not an unreasonable request. Neither is closing the gun show loophole, or asking people to certify before they can legally own a gun (and re-certify every few years, like a driver’s license), or requiring a class which educates you on responsible, legal gun ownership versus hand-me-down stories of what can do (or get away with) with a gun. It is a 100% perfect system? Absolutely not. A determined person will always find a way to do whatever they’re going to do. But just because the idea or implementation is not 100% perfect doesn’t mean that we shouldn’t bother doing anything at all. The United States has 3–4× the number of gun-related murders per capita than any other modern, civilized nation. 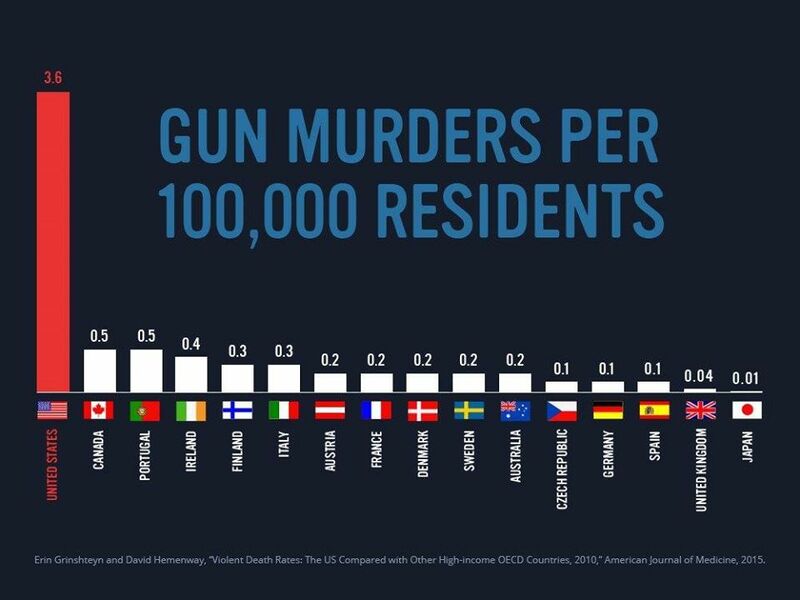 This does not include accidental gun-related deaths. Guns don’t kill people. People kill people. But that doesn’t absolve our society of responsibility for the actions that we allow our people to take. Yes, it is true that people kill people. But a gun in the hands of a dangerous person is capable of taking a substantially higher number of lives at once than nearly any other weapon humankind has ever devised1. We do not show enough respect for this dangerous capability as we should as a society. What if we could reduce gun-related deaths by 20%… 30%… 40%? Would that be worth it? Are the lives of those people are worth it? Are the lives of the kids at Sandy Hook Elementary worth it? Are the lives of the reporter and cameraman who were gunned-down on-air worth it? Are the lives of the kids who get a hold of their parents’ gun and accidentally kill themselves, their parent, or their siblings worth it? Guns are far too easy to purchase through legal channels because of well-known loopholes in the system. By closing the legal loopholes, law enforcement can spend more time focusing on covering illegal gun sales. France, Germany, Canada, the UK, Ireland, Sweden, Australia, Spain, and even the Czech Republic are ahead of us on this issue. For a country which claims to be the best country in the entire world, how can we continue to justify such an outrageous failure of our society? Gun control does not mean taking away your guns. It doesn’t mean a disarmament of you and your family (unless your family is crazy, of course). It refers to the enforcement of the responsibility of owning a gun. You’re responsible, right? The founding fathers granted us the right to form and maintain a militia… using muskets. They did not know that one day the weapons industry would rake-in billions of dollars per year. They did not know that our society would shift from being primarily rural to being primarily urban/industrial. It does not mean that you are guaranteed the right to own assault weapons. How long are we going to stand by and do nothing (except pray) while angry/crazy people shoot-up large groups of people? How long are we going to update our Facebook profile photos with the French flag, or hear about yet another mass-shooting (San Bernadino, Orlando, Sandy Hook, Virginia Tech, Columbine, etc. ), and choose to do absolutely nothing at all about lifting a finger to make things better? Because guns. Or politics. Or religion that has been tainted by politics. They have propagandized the heck out of the second amendment, and the gun industry is — ahem — making a “killing” in revenue. I have concerns about unfettered gun ownership. I’m sure that you also have your own concerns about the gun ownership issue. But we certainly recognize that a problem exists, right? That mass-shooting after mass-shooting is not normal, right? We don’t live in central Africa, or Colombia, or Mexico City, right? We need to work together to come up with something better than what we have today. Maybe you don’t like the phrase “gun control”. Fine. But you agree that we shouldn’t hand-out handguns to crazy people like candy, right? You agree that having a waiting period is a good thing, right? And that a standardized psychological evaluation could be a good thing, right? So let’s start there and work together to come up with something better than we have today. THAT is the definition of “gun control” — the rules by which people can buy, sell, and own guns (which, may I remind you, are some of the most dangerous weapons that humankind has ever invented). You wouldn’t hand a toddler a hunting knife, would you? Maybe I was wrong. Maybe we Americans have gone so far off the rails that we’ve become irredeemable.